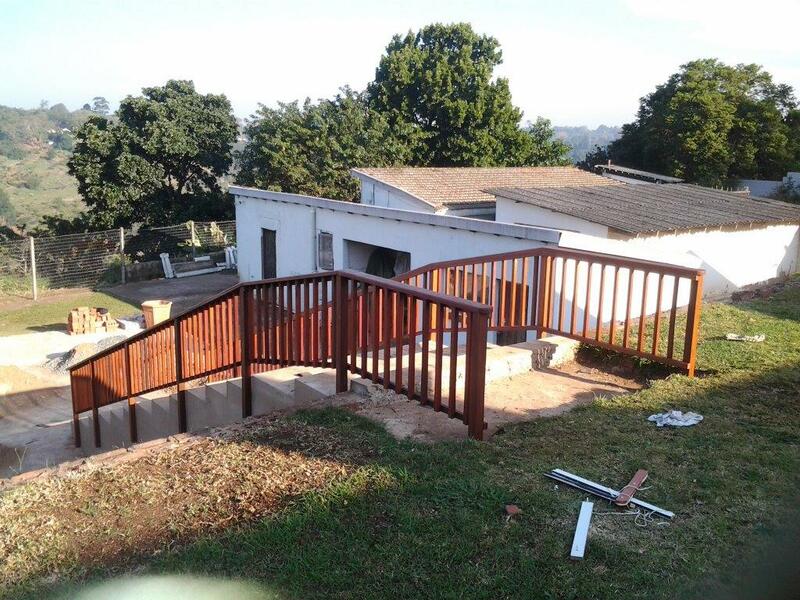 This wooden balustrade we built in Everton Kloof, Durban was for an established client of ours that we have done various amounts of work for in the past. She had had some stairs built in brick and concrete down the bank to access the lower level of her property. We had to wait a few weeks in order for the concrete to cure properly before we drilled into the side of it. It is always a pleasure installing a wooden balustrade onto a concrete substrate as opposed to a brick or block substrate. With concrete your holes can be drilled easily and the sleeve anchors used to secure the posts to the side of the stairs take nicely and bind properly. When drilling into bricks, or even worse blocks, the cavity that exists in the brick or block almost always creates a problem in that the sleeve anchor has nothing to set itself against and ends up turning on itself and not binding properly. It is most frustrating and sometimes results in drilling new holes to find a solid substrate or even going the chemical anchor route. If one is drilling into blocks with large cavities, it is sometimes better to go the chemical anchor route from the beginning. Chemical anchors come with sleeves that are inserted into the holes first and then the two-part chemical is squeezed into that and then a thread bar is inserted. The chemicals dry very quickly, in a few minutes or less, and the thread bar is then fixed securely in the wall. A post can now be pre drilled and inserted over the thread bar and washers and nuts fastened onto that. It is a much stronger bond than sleeve anchors, albeit more expensive. Currently chemical anchors can cost about R300-00 per tube, the size of a tube of silicone, and the sleeves are about R15-00 each. This wooden balustrade needed to have a bend in it that can be seen from the pictures alongside as the top tread was deeper than the rest of the treads. There was a small landing at the top where the balustrade needed to be level with ground. This was the normal vertical picket style balustrade and we sealed it using our favourite Timberlife Satin Wood Base 28 in a mahogany tint. Using this product will result in lower maintenance costs going forward as no sanding will be required when re-sealing. You simply clean and re-seal. Balustrades are not the easiest thing to install. One needs to be very careful that both rails are parallel to each other and that they are parallel to the tips of the risers. Of course the tips of each riser will not necessarily be in a straight line. What we do is run a straight edge or fish line across all the risers to get an average line that we work from. The lower rail is then set parallel to this line and the top rail and hence the capping is set to this, again parallel. One also needs to be careful when taking corners. Often the distance between the capping and the steps can vary, especially if there is a landing involved. Where a balustrade arrives at a landing one needs to step the balustrade so that the capping will remain at the 1m mark above ground. 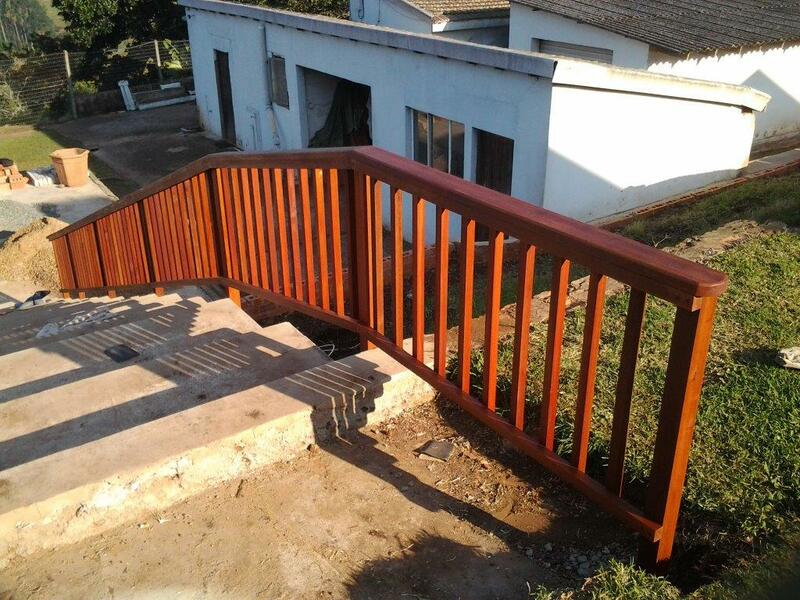 For a free no obligation quote on your wooden balustrades or other timber construction, please complete the form below and I will contact you or you can contact us on 031 – 762 1795. These wooden stairs we built in were quite interesting because the client had a dining room which was raised about 600 from the patio outside. He wanted to be able to access the dining room through the new sliding doors. So we designed a small landing and some stairs to fit snugly in on one side so as to not take up too much space on the patio yet still allow a safe passage down the stairs. There were only a total of two treads plus the landing. It not only added value by creating an access point but also added charm with wood. We built the entire landing on the ground from balau, screwed it all together and then lifted it into place and attached it to two walls of the house using sleeve anchors. This method also kept the whole landing in the same plane i.e. no cleat and joist system but rather a joist and fascia beam system. Each method has their own applications. If it is a fairly large deck where it would be impossible to attach each joist to the beam and then lift it into place, then one would need to use a cleat, beam and joist system. However where it is possible to attach each joist to the beam or fascia beam then it can be semi pre assembled and lifted into place. This can also successfully be done with a deck that is quite close to ground as the ends of the joists can be supported quite easily while the other ends are attached to the fascia beam which is then attached to the wall. However a deck that is raised off the ground would pose problems in trying to support each joist individually while attaching them and then lifting the entire structure up. The fascia beam system also allows one to keep the structure in the same plane and if space beneath the deck is limited then this is a better option. We clad or screened the underside of this landing to create a storage area with a hinged door on one side so that it could be closed and locked. This one we finished with Timberlife Ultra Care Gold as it was not exposed to direct sunlight. The Timberlife Satin Wood Base 28/28 has a much lower wax content so tends not to blemish that easily in direct sunlight. The Ultra Care Gold however has a much higher wax content and the UV in the sunlight tends to make it go a bit blotchy which can result in you having to sand it all off when it comes to maintenance. 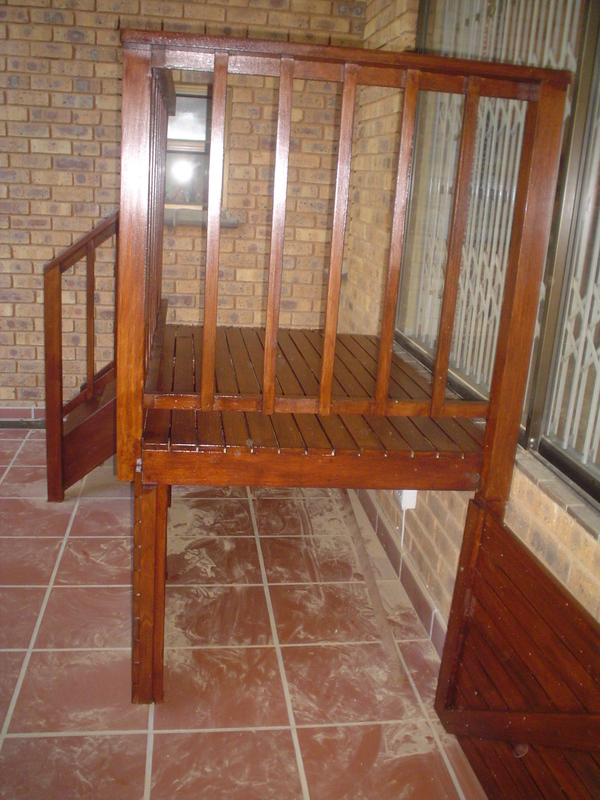 The key to low maintenance in wooden decks is to apply the correct finish correctly. To sand an entire deck back to wood and remove all traces of finish is almost impossible and at times I have thought it would be cheaper to simply replace the entire deck. This was a small day which took us a day to complete. We also added a small gate for him on the existing deck, so in total it was a two-day job with sanding and sealing. 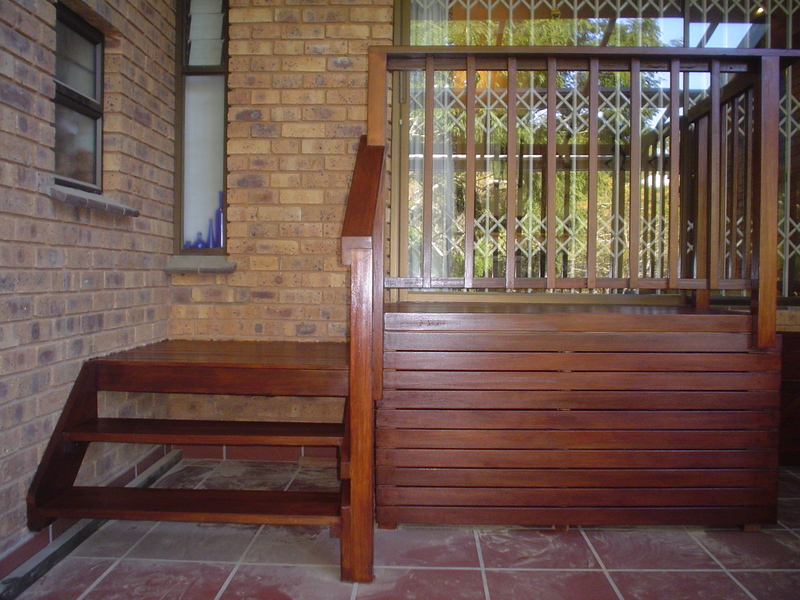 For a free no obligation quote on stairs or other wooden structure please complete the form below and we will contact you or you can call us on 031 – 762 1795. 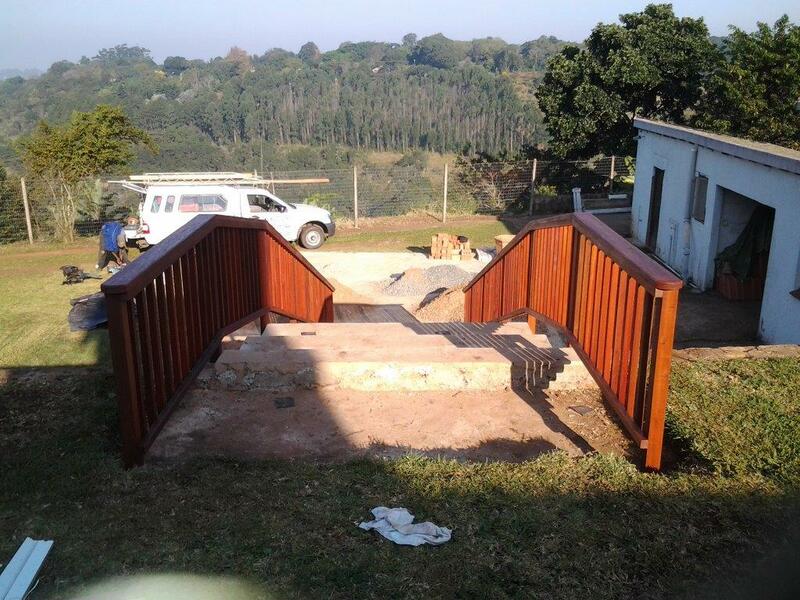 This was our second deck we built in Durban using CCA pine as a substructure. I can confirm that there is a substantial cost saving using pine as a substructure and provided it is CCA treated to the correct Hazard Level (H level), then it is guaranteed by the supplier and manufacturer against rot and insect infestation for up to 50 years. So at least H3 must be used which is good for outdoors, exposed to the elements and if there are parts of it that are making contact with ground then H4 is better. In fact the cost difference between H3 and H4 is so slight that I am tending to just use H4 throughout as a matter of course to err on the side of caution. 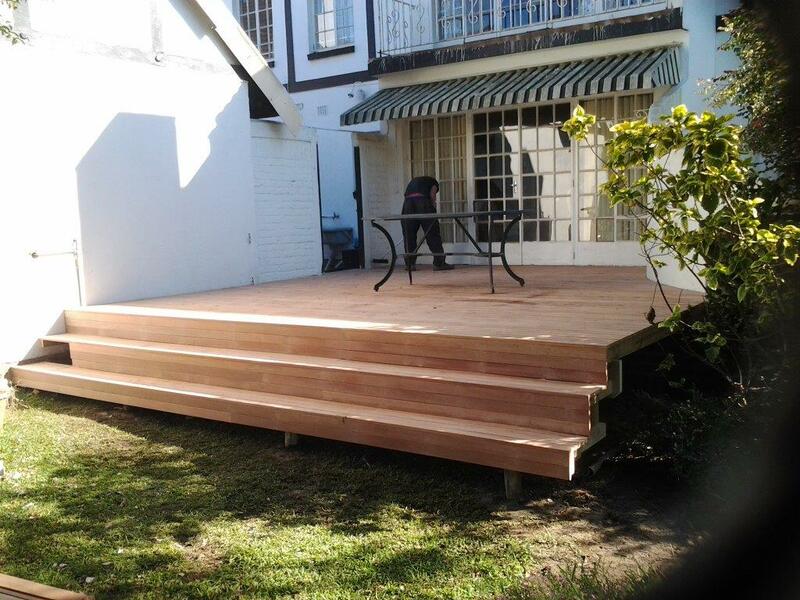 This deck extended from the house outwards about 5m. Half of that 5m length was on existing tiles and concrete so we placed batons of 38 x 76 and the rest of it dropped down about a metre onto soil. We chose 76mm as our width of baton because it brought us up to exactly where we wanted to be in terms of height of the deck in order to clear the bottom of the door. We therefore had very little space between joist and the tiles so there was very little packing to do. When we place batons on the ground as joists, we fix them using a hilti. The hilti is really just to stop the joist moving sideways and not really up or down as once the deck is built the weight of it keeps it from lifting up. However the hilti provides enough fixing power in both directions so sleeve anchors are not necessary. Often the ground on which you are fixing these batons / joists to, is not completely flat and in order to get the surface of the deck level, one needs to shim one end of the baton or joist. This results in one end being higher than the concrete ground level and as such a gap exists between the baton and the ground. Because these batons are relatively thin (between 38mm and 76mm) they are not strong enough in their width to support the deck. They therefore need to be packed with structural grout or a building sand / cement mixture to take up the gap between the baton and the ground. The rest of the deck was elevated about 1m off the ground so from that point we installed 38 x 114 joists with a main beam running the width of the deck (parallel to the stairs in the picture). We set that back 300mm so that our span between beam and wall was only 1.9m which is the maximum I am happy to go with a 38 x 114 joist. The rest of the deck was therefore cantilevered by about 300mm. 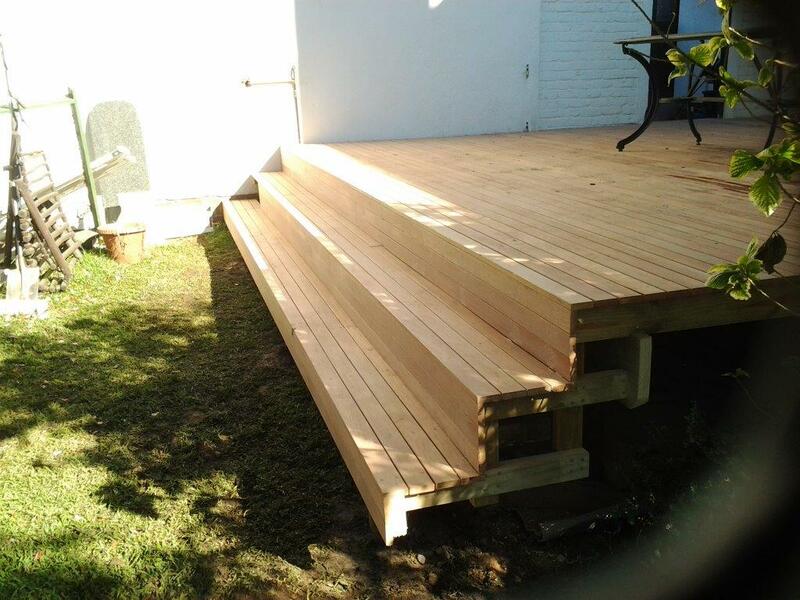 Deckboards went on without a problem, and we then built the stairs that you can see in the picture. We took a different approach to the stairs that we normally do, or have done in the past. In the past we have secured a beam all the way along the front of each riser. In this case we built treads and risers in line with each joist and then only on the front riser we fixed a fascia beam which was then secured to posts that had been set in concrete in the ground. It was much quicker than, and just as stable as our previous method. The structure that we built can be seen on one of the pics alongside. The client wanted to leave the sides open as he is planting some indigenous plants alongside to cover the gap thus allowing his access beneath the deck if need be, but once the plants grow they will cover the sides. This deck was left unsealed as the client wanted the greying effect. I will re-visit it in a few months’ time and if the client is agreeable we can bleach it and high pressure clean it in order to bring it back to its natural colour. For a free, no obligation quote please complete the form below and I will contact you. Or you can call us on 031 – 762 1795. 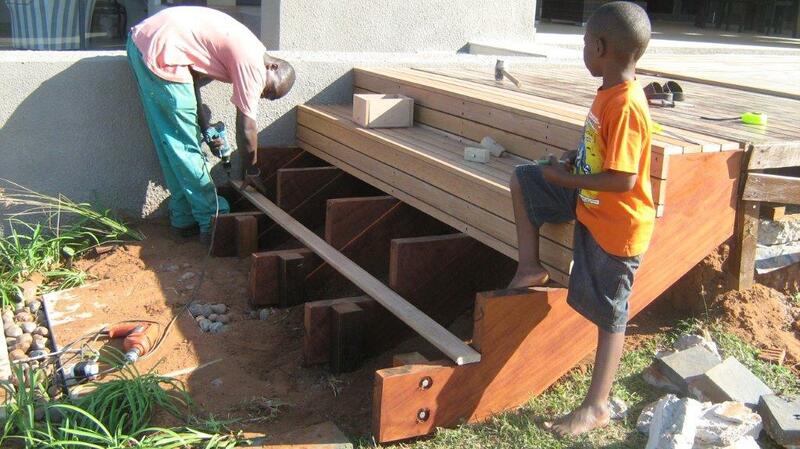 These timber stairs I built-in Durban were the first stairs I built. This was towards the beginning of my deck building career and I had no idea really what to do. 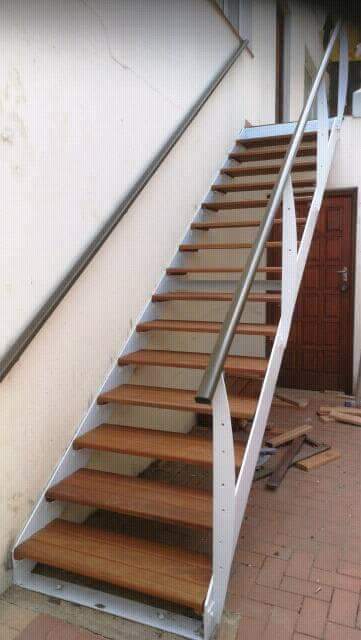 I had been involved in carpentry for a fair while so I had an understanding of timber, how it behaves and how to construct and manufacture items, but I had no idea of what needed to be done to build stairs both effectively and affordably. I resorted to Google and surprisingly, or not, I found hundreds of videos on how to make stairs. Mostly American videos so a few adaptions to our local conditions and I had a good idea of what was required. I used the more conventional, more expensive method of building stairs. 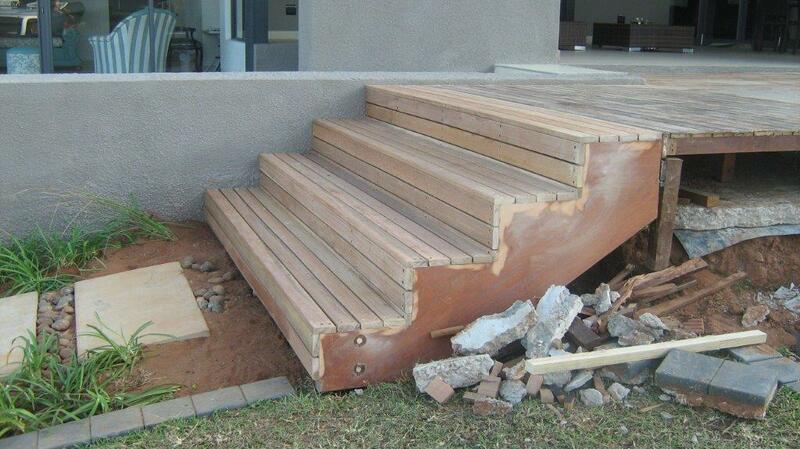 I took three pieces of 50 x 220 stock and cut my treads and risers out of the timber (see the diagram attached). This is done by first calculating the riser and tread based on the height of the deck that you need to reach with the stairs. Although an optimal height of each riser is about 190mm and the tread about 280mm, it will vary depending on the vertical height so as to keep each riser and tread the same height and length. Once these two measurements have been calculated, one uses a large steel square to draw the risers and treads on the stock. The square is simply placed on the stock and the two points are marked off on each end of the square resulting in a right angle where the tread meets the riser. The trick was cutting through the 50mm wood with a hand-held skill saw. My skill saw has a small blade so it kept jamming and burning the wood. In hindsight I would have used 40mm stock or even less as the strength of the timber exists in the width, not the thickness. So a 30 or 40 by 220 would have been much more affordable and much easier to work with. Nevertheless, we persevered and eventually had 3 lovely stringers cut and ready for installation. From there it was a matter of placing the stringers in place with the tread level and securing them in place with posts concreted into the ground. The inner most stringer was secure directly to the wall using sleeve anchors and this became our starting point from which we set the others, level to that and to ground. With all our stringers in place we decked the surface using 19 x 68 deckboards. We added a bit of substructure to the sides to accept our cladding, clad it and sealed it using a Nova product. Nova produces some top quality timber preservatives, but be careful not to mix them up with the varnishes. 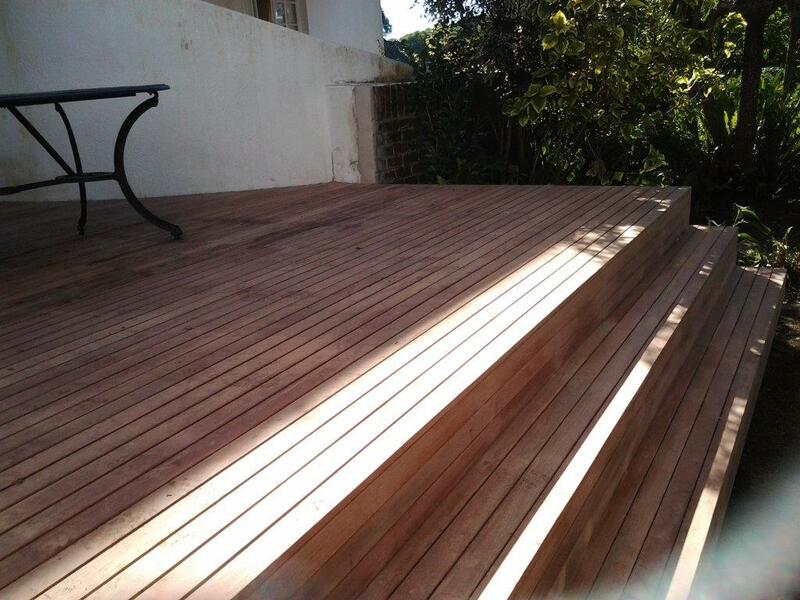 Varnish is a no go on any deck as it will peel and flake as the sun breaks it down. To get it off afterwards is near impossible and varnishing over it again results in a blotchy effect. One can’t use anything other than varnish once it has been varnished so stay away from varnish or anything that dries on the surface, with the exception of water based sealers. An article on sealing decks can be found here. You can find a large reference base on Wikipedia about stairs here. For a free no obligation quote please complete the form below and we will contact you. Or you can call us on 031 – 762 1795.